Although the figure varies by country, singles (45 rpm, seven-inch records) and LPs could attain “gold” status depending on how many copies they sold. In America, for instance, half a million copies meant gold. Prior to the 1960s, and most particularly the advent of the Beatles, when pop music blossomed, there had been very few gold records awarded; in fact the whole idea only began in 1958, by the Recording Industry Association of America. Initially, the awards were only given to those who played on the record, or were directly associated with it, which meant very few copies of each existed – this has changed somewhat over the years. But for 1960s records, it was still very much in force. The gold record itself was in a wooden frame, with an off-white linen matte (which gave rise to the term “white-matte” records to describe the style). Then the record, sprayed gold, a smaller version of the cover and a presentation plate with the RIAA logo, would all be under the matte. This style lasted until 1976, which was also when the platinum category was introduced. 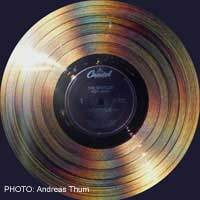 Even after music sales rose, there just weren’t that many gold records awarded; only the biggest artists qualified to receive them. What that means is that, for the most part, the few gold records that come up are by the most collectable bands, with commensurate prices. You can sometimes run into relative bargains, such as a 1967 Monkees gold disc (for an LP, not a single) for £750. For the most part, though, what appears will sell at auction, and fetch far more than that amount is the Beatles– an American Beatles gold disc for the I Feel Fine single brought £2,700 at auction, although another, for Eight Days A Week, surprisingly raised a mere £550. As a general rule LPs, when they show up, which is very rarely, go for much more. Acetates are rare and expensive pieces of memorabilia. An acetate was a disc taken from the recording session for the artist (or perhaps a music publisher) to hear. A little thicker than records put out for sale, they were really the last chance for the artist to suggest any changes in the mix, and so forth. By their nature, very few were made of an LP or a single, and few have survived from the 1960s. Among those, many have been snapped up by museums and commercial enterprises. Those that do appear will be at auction, even for the not-so-famous names. If you do decide to bid on a gold record, make sure you know what you’re buying. Anything from the 1960s will have the distinctive white matte style. If it doesn’t, then you know it’s a fake, or from a later period (which has the equally distinctive “floater” style on a black matte background). There should also be an RIAA plaque for American discs. Singles won’t have a replica of the cover. As the prices indicate, they’re not out of the reach of the ordinary collector, and their scarcity means they’re going to rise in value – you’ll certainly never lose money on them. If you do find one at auction for a reasonable price, invest in it.